75237 TIE Fighter Attack is a 4+ Star Wars set released in 2019. This is a description taken from LEGO.com. Please do not modify it. 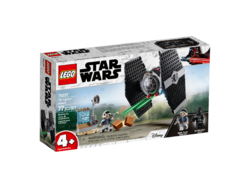 (visit this item's product page) Give your young Imperial pilot the perfect introduction to LEGO® Star Wars™ starship battles with this 75237 TIE Fighter Attack set. With an opening cockpit with space inside for the TIE Fighter Pilot minifigure and special Starter Bricks that let even first-time builders experience the pride of constructing the model, all on their own, LEGO 4+ safe learning sets are specially designed to be fun and easy for preschoolers and youngsters. 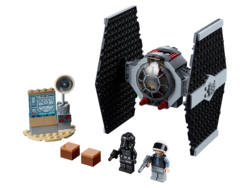 This TIE Fighter also includes a small Rebel command station and Rebel Fleet Trooper minifigure for endless play fun, while the included simple guide to build and play will also help youngsters understand the purpose of the building steps and grow their imagination and confidence for the perfect start to LEGO brick building in an inspiring Star Wars setting. Facts about "75237 TIE Fighter Attack"
This page was last edited on 11 April 2019, at 10:25.